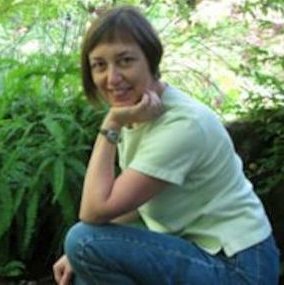 KYSO Flash: Nonfiction: Clare MacQueen: "After All These Years of Wandering"
—Dan Gilmore’s work has been called “solid gold” and “deliciously readable” by poet Steve Kowit, author of In the Palm of Your Hand: The Poet’s Portable Workshop. One of Gilmore’s flash fictions was nominated recently for a Pushcart Prize, and chosen by novelist Robert Olen Butler for the 2015 Best Small Fictions Anthology. The tiny stories and poems in this chapbook were produced especially for Issue 3 of the online literary journal KYSO Flash. They represent the fusion of narrative prose poems and American haiku. A year ago in May, I fell in love with a new-to-me form of poetic hybrid, the haibun. How I had managed to overlook it for 30 years since my first creative-writing courses in college amazes me—but better to discover it late than never, as my mother used to say. Haibun are prose poems which include at least one haiku. Of course, an in-depth discussion of the haibun’s history and complexity is beyond the scope of this introduction. In a walnut-shell then: I understand haibun to exist on a continuum, from conventional to experimental. The conventional are written in a journalistic or “factional” style, and because the prose reports on a single moment, it’s expected to be rooted in physical reality. The haiku typically includes a seasonal reference, and the best ones often derive their power from juxtaposition. Usually, only one haiku appears, at the end of the haibun, though its role is more than mere attachment. On the contrary, the haiku may offer an epiphany or revelation which the prose points to, often obliquely. On the other hand, in unconventional haibun such as haibun stories, any number of haiku may appear anywhere in the text. Their role typically expands and deepens the prose. Not surprisingly, experimental haibun may dispense with rules of the traditional form—especially when written by practitioners working in English who may happily ignore the syllabic and line-length restrictions of traditional haiku. Plus, although they may include the factional as well, haibun stories lean in various degrees toward imagined or embellished realities by employing one or more elements of fiction, such as dialogue, characterization, and plot, to tell the Truth of an experience. Just before Sleep, a chapbook of extraordinary haibun of the “ordinary sacred,” is the remarkable result of an experiment, i.e., Dan Gilmore’s enthusiastic answer to a challenge for writers of prose poems and micro-fictions in February: “Try your hand at haibun stories!” And then, submit them to KYSO Flash for possible publication. Gilmore was the first to send us works on the first of March, when the reading period for Issue 3 opened. “A Smart Fly,” “Just before Sleep,” and “Seagulls” impressed us so much that we invited him to submit others as well. Which he did right away, to my delight. I was already a fan of his writing, having read and published a few of his prose poems and flash fictions. Dan Gilmore’s poems are filled with wisdom, deeply touching, eminently readable, and often humorous. They mirror our own truths as well, and help bring us home to ourselves. 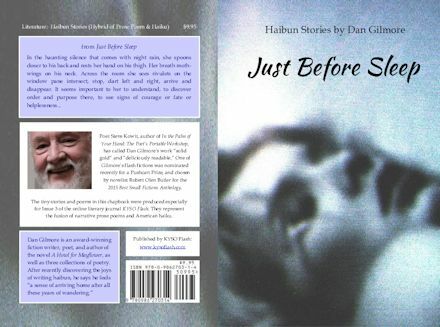 The print version of Just Before Sleep is available at Amazon. is Editor-in-Chief and webmaster for KYSO Flash, and has also served as copy editor and webmaster for Serving House Journal since its creation five years ago. Her short fiction and essays have appeared in Firstdraft, Bricolage, and Serving House Journal, as well as the anthologies, Best New Writing 2007 and Winter Tales II: Women on the Art of Aging. She won an Eric Hoffer Best New Writing Editor’s Choice Award for nonfiction and was nominated twice for a Pushcart Prize in nonfiction. Ms. MacQueen and her husband Gary Gibbons have designed and built custom websites as a team for ten years. They also share avid interests in sci-fi movies, flower gardens, and urban beekeeping.